The Point: Local and California leaders gathered in Norco to celebrate the start of construction to add express lanes to I-15 between State Route 60 and Cajalco Road..
A crowd of well over 250 people, including state legislators, California Transportation Commissioners, local leaders and a mounted posse color guard, celebrated an equestrian-themed ground breaking ceremony for the I-15 Express Lanes Project. 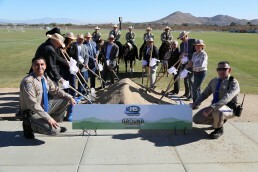 The event took place at the SilverLakes Sports Complex in Norco on December 6 and was hosted by the Riverside County Transportation Commission (RCTC). 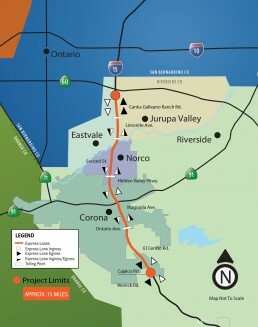 The I-15 Express Lanes Project adds two express lanes in each direction of the I-15 for a distance of approximately 15 miles between State Route 60 near the San Bernardino County Line and Cajalco Road in Corona. Construction on the Design-Build project is expected to begin in earnest early next year and will conclude in 2020. RCTC is investing $471 million in the project which travels through the cities of Eastvale, Jurupa Valley, Norco, and Corona. Funding for the effort includes a combination of Riverside County’s local Measure A half-cent sales tax program, state funding, and a federal TIFIA loan. The corridor serves a rapidly growing area and connects to major travel corridors including State Routes 60 and 91 and the addition of the express lanes will provide needed capacity for carpools, vanpools, and transit users. RCTC Commissioner Berwin Hanna, a Norco City Councilman, opened the event and expressed optimism and excitement for the project. “Today is the start of a project that will reward us with better mobility for our residents, businesses, employers, and anyone who drives through our community,” said Hanna.